Mix barbecue sauce, hot sauce, and 1 tablespoon vinegar in a small bowl. Brush corn, peppers and onions with oil and season with salt and pepper. Pat ham dry with paper towels. Brush top of ham and 2 tablespoons barbecue sauce mixture. 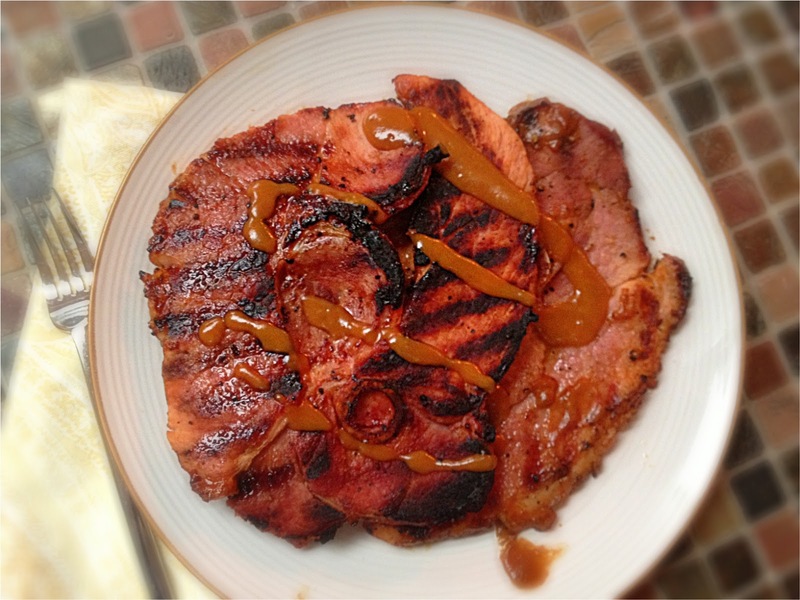 Grill ham, sauce side down, over hot fire until caramelized, 2 to 4 minutes. Surface Brush ham with 2 additional tablespoons sauce mixture, cover ham, and continue to grill until caramelized, 2-4 minutes. Repeat brushing and flipping meat 2 times more until the ham is well glazed and slightly charred. Transfer to large plate and tent with foil. Vegetables grilled over hot fire, turning occasionally, until lightly charred and tender, 5-10 minutes. Cool slightly and then cut peppercorns and onion and cut the cob. Transfer vegetables to a large bowl and toss with remaining tomatoes and vinegar. Season with salt and pepper. Cut ham steak. Serve with vegetables.